How stable is BriteVu once mixed? Home / FAQ / How stable is BriteVu once mixed? As long as properly mixed BriteVu is kept at or above 37o C (98.6o F) on a spinning hot plate, it will remain as a stable liquid. Heated liquid BriteVu will lose water due to evaporation and may periodically need small amounts of water added. How much fluid in cc (or ml) does each package of BriteVu make?What size needle can properly prepared BriteVu pass through? Red eared slider blood supply seen with BriteVu!! BriteVu perfused whole human cadaver!!! 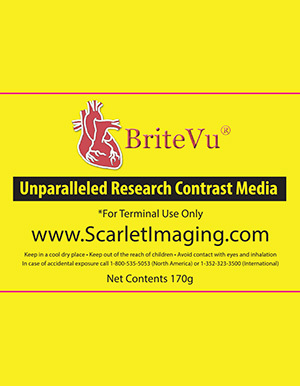 If I have a research project and would like to discuss using BriteVu, can I consult with a Scarlet Imaging, LLC scientist? Scott Echols is a rare individual in the world of laboratory innovation. His genuine curiosity and desire for science outweigh other motivations. He wants to see good science get done. To that end, Scott will do whatever it takes. The product (BriteVu) is great but I think what makes everything successful is Scott’s enthusiasm and diligence. As an equine surgeon and clinical researcher with a focus on the equine head, it is readily apparent that many diseases involve vasculature. Through a research project aimed at treatment of orosinus fistula, we became particularly interested in the vascular anatomy of the equine oral cavity. 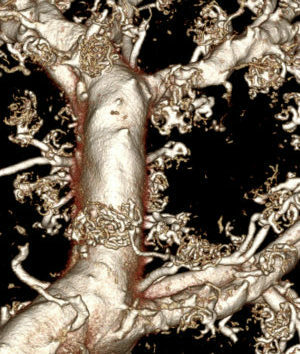 Information regarding vasculature anatomy beyond the major vessels was limited. We learnt of Dr. Scott Echols and his research into terminal vascular contrast agents through our mutual association with Epical Medical Imaging. Scott had a wealth of knowledge regarding the study of vasculature and we quickly began to collaborate on a project to use BriteVu in the horse. He was able to guide us in developing protocols and traveled to be on site to oversee the first ever perfusion trial in the horse using BriteVu. The BriteVu study was an outstanding success delivering amazing vascular detail that we desired for our research. Scott was instrumental to our success, guiding us in the procedure, reviewing CT images, and leading us to software engineers that could further develop our data. Scott has a genuine vested interest in the successful outcome of the project, and it could not have had a better collaboration experience. 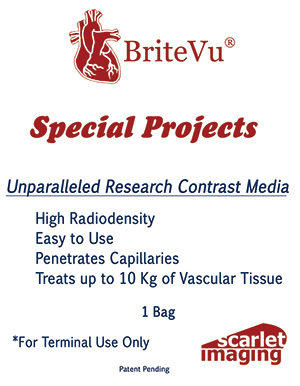 BriteVu is a superior product that gives accurate localization of fine vascular structure following our experiments. The compound is stable, easy to use, and nontoxic. 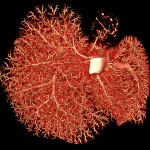 This product is vital for our research to visualize the coronary vasculature of the heart. Dr. Scott Echols is an excellent resource and has answered many questions and helped us design a protocol that fits our unique experimental needs. BriteVu truly is a fantastic product with great company support. 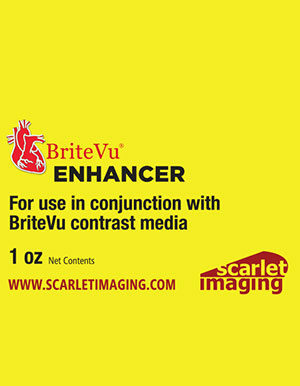 BriteVu proved to be an practical and versatile choice for a contrast agent. It was used in a series of studies involving perfusions as part of an effort to characterize the effect of a commercial drug candidate on vascular development. Ease of preparation and cost efficiency make it an excellent option for exploratory research. 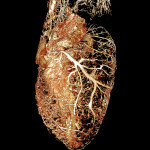 BriteVu has been a tremendous tool to visualize and measure cardiorespiratory vascularization. The solution was simple to prepare and Dr. Echols was extremely supportive and helpful in helping design a protocol for my needs. 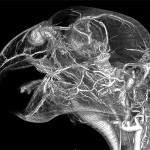 The CT images showed outstanding detail and were easy to segment and analyze with existing software. 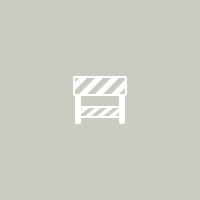 Overall BriteVu is a fantastic product and the company provides exceptional service.